Not to be confused with Nixon v. United States, a 1993 case about the impeachment of Judge Walter Nixon. United States v. Richard Milhous Nixon, President of the United States, et al. The Supreme Court does have the final voice in determining constitutional questions; no person, not even the president of the United States, is completely above the law; and the president cannot use executive privilege as an excuse to withhold evidence that is "demonstrably relevant in a criminal trial." Rehnquist took no part in the consideration or decision of the case. 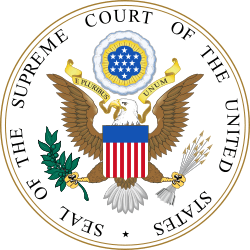 United States v. Nixon, 418 U.S. 683 (1974), was a landmark United States Supreme Court decision which resulted in a unanimous 8–0 ruling against President Richard Nixon and was important to the late stages of the Watergate scandal. It is considered a crucial precedent limiting the power of any US president. Chief Justice Warren E. Burger wrote the opinion for a unanimous court, joined by Justices William O. Douglas, William J. Brennan, Potter Stewart, Byron White, Thurgood Marshall, Harry Blackmun and Lewis F. Powell. Burger, Blackmun and Powell were appointed to the Court by Nixon during his first term. Associate Justice William Rehnquist, a Nixon appointee, recused himself as he had previously served in the Nixon administration as Assistant Attorney General. The Watergate scandal began during the 1972 Presidential campaign between Democratic Senator George McGovern of South Dakota and President Nixon. On June 17, 1972, about five months before the general election, five burglars broke into Democratic headquarters located in the Watergate building complex in Washington, D.C. In May 1973, Nixon's Attorney General, Elliot Richardson, appointed Archibald Cox to the position of special prosecutor, charged with investigating the break-in. In October 1973, Nixon arranged to have Cox fired in the Saturday Night Massacre. However, public outrage forced Nixon to appoint a new special prosecutor, Leon Jaworski, who was charged with conducting the Watergate investigation for the government. In April 1974, Jaworski obtained a subpoena ordering Nixon to release certain tapes and papers related to specific meetings between the President and those indicted by the grand jury. Those tapes and the conversations they revealed were believed to contain damaging evidence involving the indicted men and perhaps the President himself. Sirica denied Nixon's motion and ordered the President to turn the tapes over by May 31. Both Nixon and Jaworski appealed directly to the Supreme Court which heard arguments on July 8. Nixon's attorney argued the matter should not be subject to "judicial resolution" since the matter was a dispute within the executive branch and the branch should resolve the dispute itself. Also, he claimed Special Prosecutor Jaworski had not proven the requested materials were absolutely necessary for the trial of the seven men. Besides, he claimed Nixon had an absolute executive privilege to protect communications between "high Government officials and those who advise and assist them in carrying out their duties." Less than three weeks after oral arguments, the Court issued its decision. The justices struggled to write an opinion that all eight could agree to. The stakes were so high, in that the tapes most likely contained evidence of criminal wrongdoing by the President and his men, that they wanted no dissent. All contributed to the opinion and Chief Justice Burger delivered the unanimous decision. After ruling that the Court could indeed resolve the matter and that Jaworski had proven a "sufficient likelihood that each of the tapes contains conversations relevant to the offenses charged in the indictment," the Court went to the main issue of executive privilege. The Court rejected Nixon's claim to an "absolute, unqualified Presidential privilege of immunity from judicial process under all circumstances." Nixon resigned sixteen days later, on August 9, 1974. ↑ Kutler, Stanley L. (1992). The Wars of Watergate. W. W. Norton & Company. p. 508. ISBN 0-393-30827-8. Retrieved May 4, 2009. Rehnquist recused himself in the case, citing his past association with the Nixon Administration. ↑ Trachtman, Michael G. (2007). The Supremes' Greatest Hits: The 34 Supreme Court Cases That Most Directly Affect Your Life. Sterling. p. 131. ISBN 978-1-4027-4107-4. Retrieved 2011-05-12.